We came to Pukenui Holiday Park on the recommendation of a mate of my husband and planned to stay two or three nights with our grandchild. We travel a lot in our motor home and are experienced campers. So much for two or three nights – we stayed for a week! And we could easily have stayed longer but needed to move on. I am quite particular about cleanliness of toilets and kitchens and I was impressed when I first saw them and that they were well cleaned each day. My husband on the other hand is far more interested in things to do. Within walking distance there is the wharf where everybody seems to catch a fish. 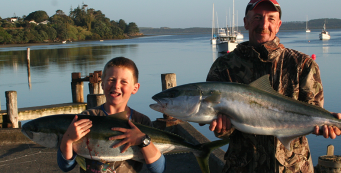 It’s unbelievable the array of fish life in the harbour – that’s if the locals are to be believed! We did see some pretty massive ‘kingies’ (or kingfish) meandering along under the wharf while we were there. Nearby is a little supermarket, bar and restaurant and bottle store. Further, by vehicle, is Ninety Mile Beach and a delightful café. The Houhora Heads are also close. The Park has a menagerie of animals – sheep, miniature horses, hens, ducks, geese and a couple of cats that will visit you given half a chance. There is also a tree house and swing rope. My grandchild loved the animals and was able to help feed them and even had a ride on one of the small horses. People were so friendly. The staff were supportive and caring – nothing was too much trouble for them. Advice on what to do and where to go, fixing a blocked sink on our camper – all we had to do was ask. They always seemed to have time to chat when we saw them. This friendly approach had the effect of breaking down the barriers of strangers and so making all of our times there very relaxed and enjoyable. Will we be back? Absolutely we will!